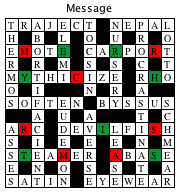 The following graphics show a Crossword puzzle in the Crossword Express Build screen and a PNG graphic file produced by the program's print function, showing the complete puzzle. See also a full size version of a PDF file showing the puzzle. Fully manual construction is available for those who prefer to individually select each word used in the puzzle. 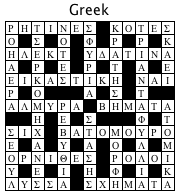 The words can be typed into the puzzle, or selected from a list of suggestions offered by the program. Optionally, a number of letters or words can be entered manually before requesting the program to complete the puzzle building task. Up to four Theme Dictionaries may be selected before building begins. The program takes as many words as it can from the theme dictionaries. Only when no such words are available does it use a word from the Standard Dictionary. A Review feature allows you to quickly scan through all of the clues in a puzzle. An Add Clue function allows you to add any clues which may be missing, or to edit any which you might like to change. These were made using Polish-English, Russian-English and Greek-English dictionaries (ie. Polish, Greek or Russian words with English clues). 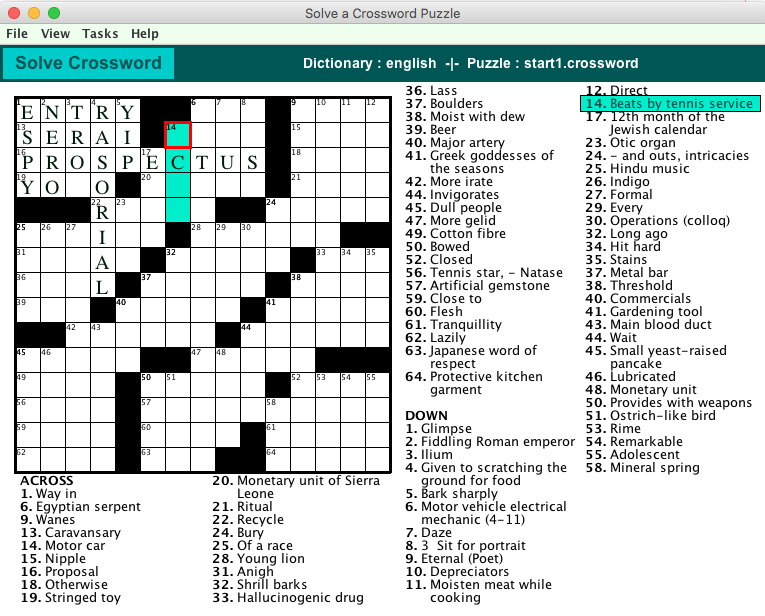 These can be downloaded from the Internet directly into the Crossword Express application installed on your Windows or iMac computer using the Tasks/Download Dictionary function of Dictionary Maintenance. A total of 32 dictionaries of this general type are currently available. Right to Left Language Puzzles. The subject of foreign language crossword puzzles becomes especially interesting when you encounter languages such as Arabic and Hebrew in which the flow of written text is from Right to Left. When you create a Crossword Express dictionary involving such a language, you can set dictionary properties which specify that the word or clues (or both) are to be displayed in the Right to Left mode. Then, when the puzzle is constructed, the Across words will be placed into the puzzle in the Right to Left direction. (Note however that the Down words will still appear in the downwards direction.) 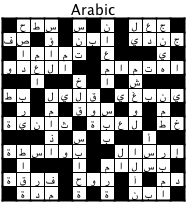 The image at left shows a PNG file which was created by the Export option of the Crossword Express Print function operating on a puzzle which was constructed from a dictionary containing Arabic words. This image is also a link to a PDF file which contains a much higher definition image of the puzzle. When you study this PDF file, you will see that the ID numbers which identify the clues also flow across the puzzle from Right to Left. 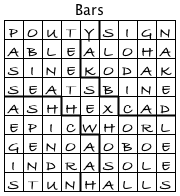 The use of bars rather than block cells is favored in some countries, as it allows the nice feature that every cell in the puzzle contains a letter. There are both horizontal and vertical bars, and a word ends when it encounters such a bar. 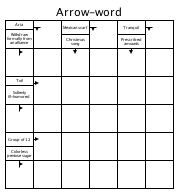 The Grid Maintenance function of Crossword Express allows you to construct barred grids, and the crossword construction function will construct the puzzle just as easily as it constructs a standard puzzle. The graphic also demonstrates the fact that you can select any font supported by your computer when printing the letters of the puzzle. This puzzle makes use of the Bradley Hand font supplied with an iMac computer. 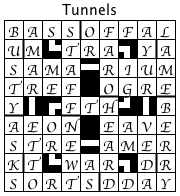 In a tunnel puzzle, a word which encounters a tunnel cell will continue on the other side of the tunnel, possibly undergoing a change of direction in the process. This allows the situation where a fifteen letter word such as STRAIGHTFORWARD can appear in a small 9x9 puzzle as you can see in this case. 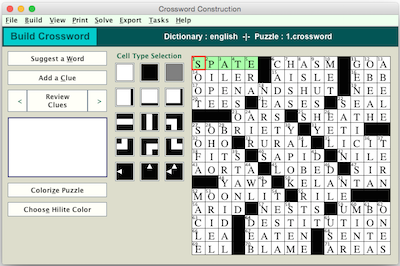 When designing a new grid, tunnel cells may be freely mixed with normal block cells and bars, and Crossword Express will still generate the puzzle automatically. This puzzle displays letters using the Apple Chancery font supplied with an iMac computer. This is a handy variation on the concept of foreign language puzzles described above. The puzzle has French words and English clues, and an additional area containing a list of words. The list contains all of the French words in the puzzle, along with an equal number of words selected randomly from the dictionary which was used to construct the puzzle. It is expected that this would be a very useful vocabulary exercise in the teaching of second languages. An interesting variation on crossword puzzles is to have some of the words (or even all of them if you wish) inserted into the puzzle in the reverse direction. 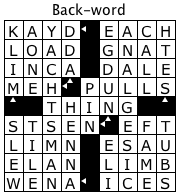 If you create a grid with some of the pattern cells replaced by the Reverse Indicator pattern cells (the three which contain white arrows pointing either up or to the left), then when Crossword Express builds the puzzle it will ensure that the words pointed to by these arrows will be inserted in the direction indicated by the arrows. When you print this puzzle you have the option of changing the color of the Reverse Indicator arrow (use the View menu option on the Print screen), and if you change the color to black, the direction arrows will no longer be visible. This makes for an interesting puzzle in which some of the words are reversed, but the solver will be unaware which words they are. The ability to preset certain letters into the puzzle grid before it is built, plus the ability to colorize a puzzle cell after the puzzle has been built make it a simple matter to insert a message into the puzzle. As the solver progresses with solving the puzzle, a message gradually appears. As shown in this sample any number of different colors can be chosen for the task. Australian crossword fans of a certain age would remember a puzzle called Mr Wisdom's Whopper which was for many years the largest regularly published crossword in Australia. 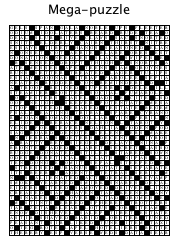 It was 32 cells across and 42 cells down, and during much of the 1990s an early version of Crossword Express was used to create the puzzles. The person responsible for these puzzles was so delighted at the amount time and effort which was saved by using Crossword Express, he finally presented me with a copy of the dictionary which he was using to make the puzzles, and said that I could use it in any way I chose. He is no longer making puzzles, so there is now nothing to stop me including that dictionary as part of Crossword Express. I have simply merged it with the English dictionary which I distribute with the program. I have also included a total of five new grids called mega1 to mega5 which are suitable for making the large puzzles. For Copyright reasons they are naturally not the same as the original Mr Wisdom's Whopper grids. In these puzzles, the clues are included in the grid in the locations normally occupied by the black pattern cells. Due to the limited space, clues should be kept as short as practicable. A great deal of care is required when designing a new grid for such a puzzle. Pattern cells must be carefully positioned so that space will be available for the clues to each and every word. If you have used the fully automatic method of creating a puzzle using one of the dictionaries provided by Crossword Express, you will have a puzzle for which you don't necessarily know the answers, and may therefore wish to solve for yourself. 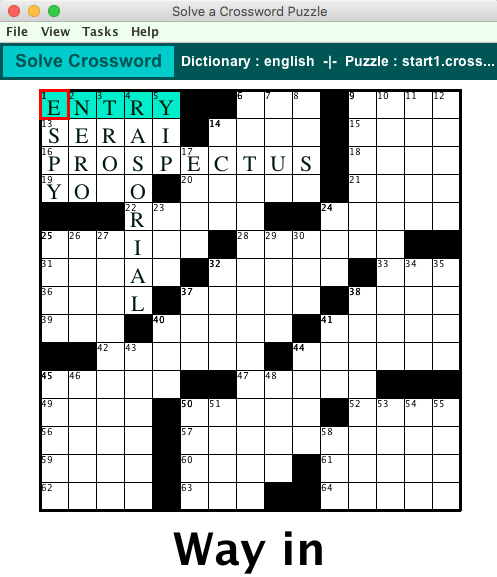 You can of course solve it using a printed copy of the puzzle, but a better method is to use the interactive Solve function provided by Crossword Express. The following image is a screen shot showing a typical puzzle loaded into the solve screen. 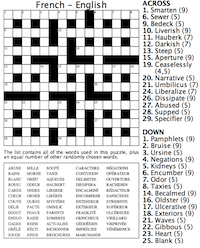 Features of the Crossword Solve Function. The Solve screen is resizable to allow you to accommodate puzzles in a wide range of sizes. The program automatically adjusts the number and size of clue columns and the size of the clue font. Answers can be typed directly into the puzzle. Characters will appear in the cell indicated by the red cursor. The cursor will then move on to the next letter of the current word. A mouse click in any cell will transfer you to one of the words passing through that cell. If the program selects the word which is not the one you wanted, a second mouse click will move you to the other word which passes through that cell. The arrow keys will move the cursor cell around the puzzle, one cell at a time. A mouse click on any clue will move the puzzle focus to the word associated with that clue. A mouse click on the currently highlighted clue will start your default web browser, and send the current clue to Google as a search string. This results in the familiar list of web pages which will usually provide the answer you seek. The Tasks menu item provides you with a number of options which will help during the solving of the puzzle. There is a second Solve Function (Audience Mode) which is similar to the normal Solve function, except that only a single clue is displayed at a time, and the puzzle is displayed in a large format. 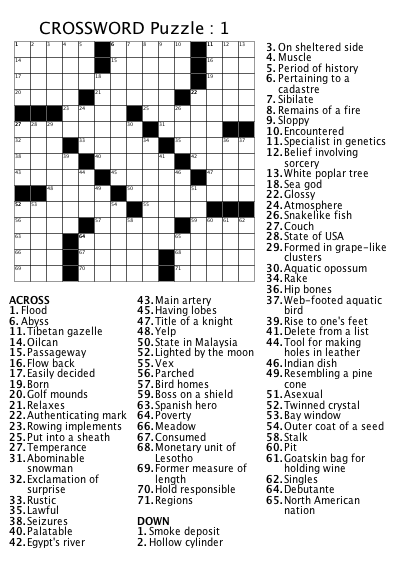 The intention is that the puzzle be displayed using a video projector or big screen digital TV connected by an HDMI cable to the computer running the Crossword Express program. This configuration has been used for the entertainment of residents of retirement homes. School teachers may also find it useful.